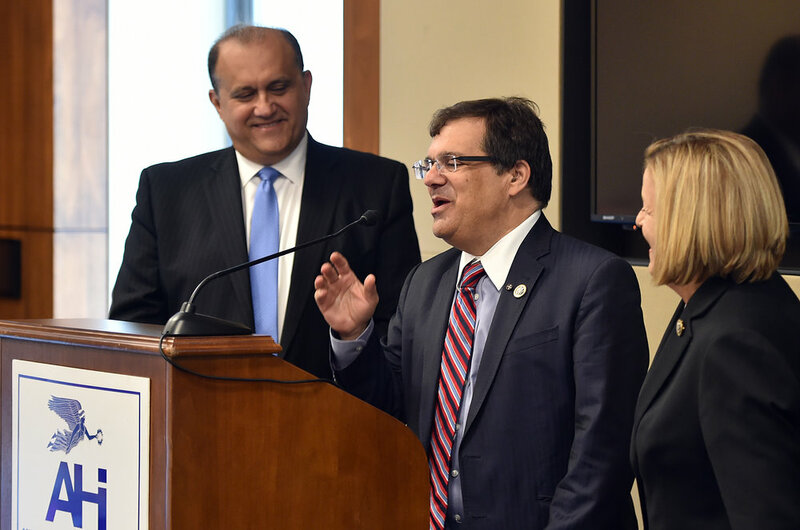 WASHINGTON, DC - The American Hellenic Institute (AHI) marked the 44th anniversary of Turkey’s illegal invasion of the Republic of Cyprus by hosting a congressional briefing to discuss the current state of affairs on the island at the Rayburn House Office Building on Capitol Hill, July 17, 2018. The briefing allowed prominent members of Congress to convey their perspectives for a solution more than a year after the collapse of the Conference on Cyprus in Crans-Montana, Switzerland. The legislators also discussed opportunities for the United States to work on this matter. AHI President Nick Larigakis moderated the briefing. He thanked the attendees for their insights on the issue and their support for Cyprus. Larigakis also reflected on the ongoing struggle of the people of Cyprus who for 44 years have endured an illegal occupation and massive violations of human rights and fundamental freedoms by Turkey, a NATO ally of the United States. In attendance were: Ambassador of Greece to the U.S. Haris Lalacos; Consul Konstantinos Polykarpou, Embassy of the Republic of Cyprus; Colonel Panagiotis Kavidopolos, Defense attaché, Embassy of Greece; Captain Charalampos Pegklidis, H.N., Naval attaché, Embassy of Greece; and Colonel Stefanos Ampouleris, Air attaché, Embassy of Greece. The briefing, held in cooperation with the Congressional Caucus on Hellenic Issues, featured as speakers: U.S. Senator Chris Van Hollen (D-MD), member, Senate Committee on Appropriations; U.S. Rep. Carolyn Maloney (D-NY), co-chair, Congressional Caucus on Hellenic Issues; U.S. Rep. Gus Bilirakis (R-FL), co-chair, Congressional Caucus on Hellenic Issues; U.S. Rep. Ileana Ros-Lehtinen (R-FL), chairman emeritus, House Committee on Foreign Affairs; U.S. Rep. Brad Sherman (D-CA), member, House Committee on Foreign Affairs Subcommittee on Europe, Eurasia, and Emerging Threats; U.S. Rep. Ted Deutch (D-FL), co-chair, Congressional Hellenic Israeli Alliance, and member, House Committee on Foreign relations; U.S. Rep. Judy Chu (D-CA); U.S. Rep. David Cicilline (D-RI), member, House Committee on Foreign Affairs and Subcommittee on Europe, Eurasia, and Emerging Threats; U.S. Rep. Chuck Fleischmann (R-TN), member, House Committee on Appropriations and member, Congressional Hellenic Israeli Alliance; U.S. Rep. Josh Gottheimer (D-NJ); and U.S. Rep. Frank Pallone (D-NJ). In his remarks, Consul Konstantinos Polykarpou spoke about how the American Hellenic Institute was founded on the principles of justice and the rule of law; and these principles also are the causes of Cyprus as the government works toward finding a solution to the more than four-decade-old problem. The consul vehemently called for an end to the injustice in Cyprus and assured that Greek Cypriots are willing, and have been always willing, to negotiate. He also noted the Greek Cypriots were the first to suffer from the horrific and illegal invasion and called upon all friends of Cyprus for further support. Consul Polykarpou concluded by thanking the efforts of AHI and the United States Congress and conveying hope for the adoption of effective legislation that will lead toward a unified Cyprus. Ambassador Lalacos’ remarks primarily centered on the threat Turkey poses to the already volatile Eastern Mediterranean. The ambassador called upon the international community to question the presence of Turkish troops in the occupied region of the island and to push back against the alarming upgrade in the Turkish government’s military strength. He also made the point that Turkey is already well-equipped to fight off legitimate threats, such as Iraqi terrorist militias. The Russian S-400s and American-made F-35s are not at all necessary for the purposes the Turkish government has stated and its ambition to obtain additional arms and planes does nothing but threaten the stability of NATO and the greater Mediterranean region. Congressman Chuck Fleischmann (R-TN): As a member of the Congressional Hellenic Israel Alliance Caucus, Congressman Fleischmann capitalized on the importance of the tripartite alliance among Greece, Cyprus, and Israel.The congressman emphasized that Israel is a steadfast ally of the United States, and Greece's and Cyprus’ close relationship with their Mediterranean neighbor is promising.The congressman also acknowledged the urgency of the perennial problem in Cyprus and encouraged the continued good-relations among Americans, Cypriots, Greeks, and Israelis. Congresswoman Carolyn Maloney (D-NY): Congresswoman Maloney, founding co-chair of the Congressional Hellenic Caucus, stressed the need to expel the more than 40,000 Turkish troops from the occupied area of Cyprus. Touching on one of the most pressing challenges currently facing Cyprus, Congresswoman Maloney stated that Erdogan has created more of a dictatorship in Turkey than ever before, making peace efforts increasingly arduous. The congresswoman also referred to the once glamorous city of Famagusta, now in ruins on the occupied side of the island, as a paradigm of the incredible damage the Turkish military has brought to Cyprus. Congresswoman Maloney concluded by encouraging the American Hellenic Institute and fellow members of Congress to “keep pushing” for a solution. Senator Chris Van Hollen (D-MD): Senator Van Hollen discussed the importance of bipartisanship, particularly relating to Turkey’s potential acquisition of the S-400 Russian anti-aircraft weapon system. In a step toward further security in the Eastern Mediterranean, Senator Van Hollen, along with Senator Lindsey Graham, offered amendments that would effectively halt the delivery of Lockheed Martin’s F-35 jets to Turkey until talks of Turkey receiving the S-400 systems are officially off the table. The senator also proposed an amendment prohibiting the sale of firearms to Erdogan’s bodyguards, following their attack on peaceful U.S. protesters last year. Senator Van Hollen closed by asserting we need a “concerted effort in the United States” to ensure safety and balance in the region. Congressman Ted Deutch (D-FL): Congressman Deutch, co-chair of the Congressional Hellenic Israeli Alliance, discussed the importance of a bi-zonal and bicommunal federation to be established within the Republic of Cyprus. The congressman also noted that Erdogan has only made the challenge of reunification greater. However, Congressman Deutch remains hopeful the United Nations will move in a positive direction with regard to resuming peace talks, and he looks forward to the time when we can come together to celebrate the eventual reunification of the island. Congressman Josh Gottheimer (D-NJ): Congressman Gottheimer began his speech by expressing that it is critical that Cyprus is “on the front burner” at all times. The congressman also noted the United States’ failure to intervene in the illegal Turkish occupation of Cyprus is forever a “blemish” in the history of U.S. foreign policy. He also emphasized the importance of a strong relationship between the United States, Greece, and Cyprus, particularly because of Turkey’s increased hostilities such as holding Pastor Brunson hostage and beating American protestors in the streets of Washington, DC. After discussing the geostrategic importance of the island in the Eastern Mediterranean, the congressman declared that “enough is enough” and that a solution needs to be made. Congressman Frank Pallone (D-NJ): Congressman Pallone began by stating that the “arms race with Turkey” is an entirely destabilizing force in the region. The congressman also emphasized the importance of prioritizing Cyprus in U.S. foreign policy. Particularly, Congressman Pallone called on the Trump administration, and specifically Secretary of State Mike Pompeo, to pay more attention to raise Cypriot interests on the agenda. 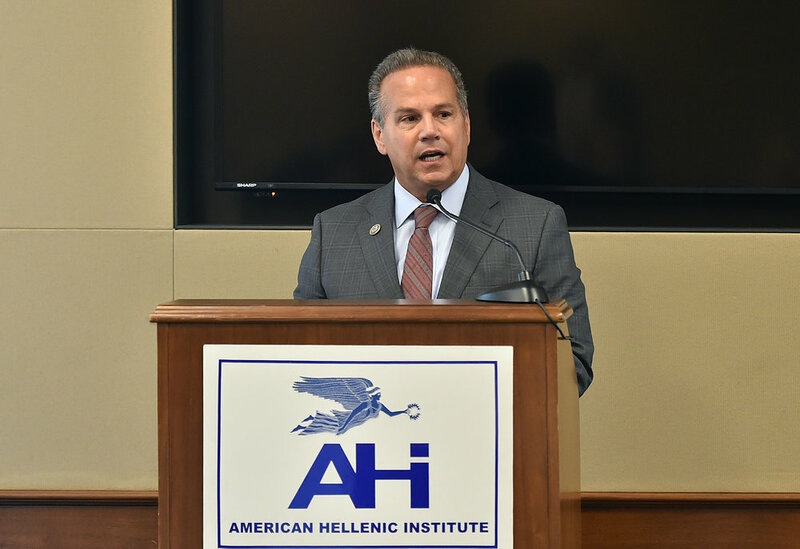 Congressman David Cicilline (D-RI): Congressman Cicilline began by drawing parallels between long-established American and Cypriot values. The congressman stated Turkey’s perpetual belligerent behavior expressly vies against NATO’s core principles and is the reason why the international community calls into question how peace talks can go forward. As a possible step toward a solution, the congressman is a strong advocate for lifting the arms embargo on Cyprus, thus strengthening the relationship between the United States and Cyprus. Congressman Brad Sherman (D-CA): On a slightly different note, Congressman Sherman began by identifying three key components that immediately require the United States’ attention: the rights of Greek Cypriots, the Ecumenical Patriarchate of Constantinople, and, of course, the reunification of Cyprus. The congressman remains convinced it is essential for all 40,000 Turkish soldiers to leave the occupied region of the island as he believes the Greek and Turkish Cypriots can have peace without their presence. The congressman also discussed his concern over the gas exploration potential surrounding Cyprus because Turkey is stifling Cypriots’ right to explore and exploit their resources within their Exclusive Economic Zone. Congresswoman Judy Chu (D-CA): Congresswoman Chu began by dubbing the illegal invasion a “war of displacement” with effects that are still felt today. The congresswoman drew parallels between Turkey’s invasion and lack of recognition of the true Republic of Cyprus with their lack of recognition of the Armenian genocide. The congresswoman emphasized that the Greek Cypriot community needs help and that diplomacy and respecting the rule of law is a way to help them. Congresswoman Chu concluded by stating that we cannot give up on a peaceful settlement. For additional information, please contact Elias Gerasoulis at (202) 785-8430 or at pr@ahiworld.org. For general information about the activities of AHI, please see our website at http://www.ahiworld.org.